PRECIOUS SWEET REVENGE- WHATS NEXT?? In the first trading week of 2014, gold was seen taking revenge to all those investors who shifted from gold to equities and other assets in 2013. Many claimed that gold has lost its glitter and is no more a return generating asset. By its performance in the first week of 2014, gold put a lock to many peaking mouths. In fact other precious metals like silver and platinum followed suit , with platinum touching a six-week high and palladium climbing to a three-week high, heading for its biggest weekly gain since October. But then again debaters said that gold has shown similar trend in 2013. Recalling gold in 2013 at this time of the year, I remember that gold moved sharply in Jan but then plunged terribly throughout the year. On 2nd Jan, 2013, gold opened at $1664. Then in Feb it was seen trading at $1660 while in March it was $1570. It was consistently seen moving down throughout the year. It crashed drastically in June and touched the 1182 mark on the last day of the year. All the hype and hoopla created by gold in the beginning of 2013, seemed to have vanished gradually by the end of 2013. Quantitative easing has always been a positive factor for gold as it held down interest rates and stoking inflation fear. But then on the other side, as labour reports and other data showed that the US economy is improving, it initiated scaling back of the stimulus programme. This is stinging into gold’s glitter. Many investors lost faith in gold as in bullion-backed exchange-traded products shrank for the first time since the first fund was introduced in 2003. Heavy outflows from gold-exchange traded funds also reflected investors’ diminishing interest. Holdings on SPDR Gold Trust, the world’s largest gold-backed exchange-traded fund, fell three tonnes to their lowest since January 2009 at 801.2 tonnes. Since October 2013, gold has been performing poorly. As it entered 2014, gold was seen to be in its best performance since October, as it rose to a two week high on Friday. This upsurge was supported by Chinese demand for gold. Chinese demand is likely to stay strong in the build up to the Lunar New Year on Jan 31st, when gold is traditionally given as a gift. 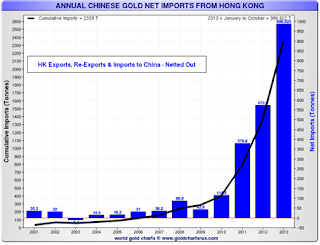 Based on published data, Chinese physical gold imports will end 2013 at more than double 2012’s record levels, at roughly 1,000 tonnes (below data is through October); and who knows how much more demand the unpublished data would uncover? For gold, the major costs of mining – i.e., mining and reserve replacement – is at least $1,500/oz., per this quote from Gold Fields’ CEO, Nick Holland (Gold Fields is the world’s fourth largest gold producer). As for silver, St. Angelo proved prices must be above $25/oz. to enable the mining industry to produce positive cash flow. Now as per the current price levels, I fear if the mines can operate, forget making money out of it. Expectations that U.S. economy will improve and the rest of the world’s growth will stabilise in 2014 have further undermined the case for holding bullion, as investors look to put their money in riskier assets such as equities. The US Fed has to be very cautious while scaling back its stimulus program as the much claimed recovery is still happening at a slow pace and can take a halt at any point of time. Things do seem to be improving in the Euro zone too. All these aspects compel us to think that gold & other bullion metals could have a bearish price impact, technically. But fundamentally, supports do remain strong. Well it’s too early to comment given the fact that there are a lot of important events coming up for precious metals in the months to come. My take would be a Gold’s price to 30% while Silver price rise to 40%.